A guide on where to find all 30 collectible Lore Documents in Vampyr. While playing through Vampyr, one thing you may want to do is find all 30 collectible Lore Documents. By finding lore documents in Vampyr, you’re able to learn more about the story in addition to unlocking the “Lore Keeper” achievement. You’ll often come across Lore Documents in new areas of the game, such as Pembroke Hospital. Having trouble finding all of them? No problem! Read on to learn where you can find all 30 collectible Lore Documents in Vampyr! Collect all 30 Lore Documents in Vampyr to unlock the Lore Keeper achievement. The trick to finding all 30 collectible Lore Documents in Vampyr is carefully exploring each new area. The first Lore Document can be found in the opening act of the game, after that, you’ll find the next once you make yourself comfortable at Pembroke Hospital. Below, we’ve listed all 30 Lore Documents and their locations in Vampyr to help make things easier. Lore Document #1: This Lore Document is found at the beginning of the game in the house you hide in from the vampire hunters. It's located on the shelves to the right of the destroyed room. Lore Document #2: This Lore Document is located in the North Docks. In the second warehouse you encounter while chasing the mysterious blood trail you'll find a corpse. Investigate the corpse to collect the Lore Document. Lore Document #3: This Lore Document can be found in Pembroke Hospital. It's located in the same room as Thomas Elwood on the first floor of the hospital. Lore Document #4: This Lore Document can also be found in Pembroke Hospital. It's located in Dr. Swansea’s office on the second floor. Lore Document #5: This Lore Document can be found in the Hospital Sewers. Outside the boss area you'll find a corpse. Investigate the corpse to collect the fifth Lore Document in Vampyr. Lore Document #6: This Lore Document is located in White Chapel. It can be found in the office desk on the second floor of Harry Peterson’s house. Lore Document #7: This Lore Document is hidden in White Chapel. To find it, enter the hideout near Dr. Crane’s Dispensary. Then, in the interior area, you'll find a room with two Skal. Kill them, then search the room to find the Lore Document. Lore Document #8: This Lore Document is located in Petrescu’s House. Once in his house, head down to the storage room and search it to find the Lore Document. Lore Document #9: This Lore Document can be found on the eastern edge of Stonebridge Cemetary. In the cemetary, look for a spot you can teleport to. This will lead you to a grass alcove where you'll find a corpse who holds the ninth Lore Document. Lore Document #10: This Lore Document is located in Enid’s House. Be sure to unlock Mesmerize Level 2 so Enid will let you in her house. Explore Enid's House to collect the tenth Lore Document. Lore Document #11: This Lore Document can be found in Sewer Dog’s Lair. Once inside Sewer Dog’s Lair, locate the room where Harriet is being kept and search the room to find the Lore Document. Lore Document #12: This Lore Document is located outside the Night Asylum. To find it, look between the crates near the Night Asylum fence. Lore Document #13: This Lore Document can be found in Ashbury Mansion. Once inside, to the painting room upstairs to collect the Lore Document. Lore Document #14: This Lore Document can be found by entering the Sewers from the steps on the West End. Head straight, then look left to find Lore Document inside a bin. Lore Document #15: This Lore Document is located in Venus’s House. Unlock Mesmerize Level 4 to convince her ot let you in, then head up to the second floor. 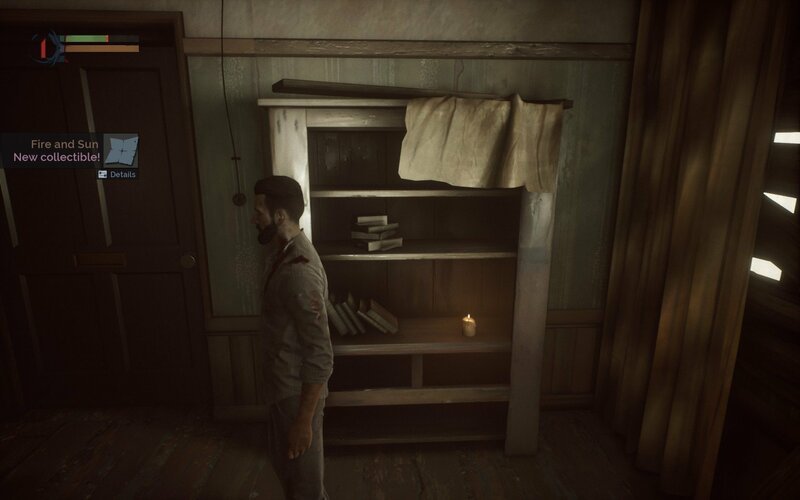 On a shelf next to the bed is where you'll find the Lore Document. Lore Document #16: This Lore Document can be found by searching the Market Square behind the Grand Theatre on the West End. You'll find a dead body, and by looting it, the sixteenth Lore Document. Lore Document #17: This Lore Document can be found by searching the Market Square north of Reid’s Mansion. You'll come across a restaurant with an NPC named Kimura trapped inside. Search the cafe and you'll also find a Lore Document. Lore Document #18: This Lore Document is located in the Ascalon Club in a room to the right of the ground floor. Lore Document #19: This Lore Document is also located in the Ascalon Club. When you have the basement key on the second floor, use it to explore the underground of the Ascalon Club where another Lore Document hides. Lore Document #20: This Lore Document can be found in the Sewers on the West End. In a passage leading into Dawson Manor you'll fight a Vulkod. Loot its body for a Lore Document. Lore Document #21: This Lore Document can be found in the basement of the cathedral in Temple Church where Dawson’s manor is located. You'll spot it on Usher Talltree’s table. Lore Document #22: This Lore Document is located in the Theatre on the West End. During the section where you explore the basement to rescue Swansea, explore and you'll also find a Lore Document. Lore Document #23: This Lore Document is located in Southwark. Enter the Foundry, kill an enemy on the ground floor, then search the body for a key that unlocks the stairwell door. The Lore Document can be found on the second floor. Lore Document #24: This Lore Document can be found in Mason’s House west of Stonebridge Cemetery. Lore Document #25: This Lore Document is located in White Chapel. Start Mason’s quest to find Braille books. If he reads them all, you’ll be able to unlock a door in the hideout east of Stonebridge Cemetery where another Lore Document hides. Lore Document #26: This Lore Document can be found in Temple Church. Complete Usher Talltree’s investigation without reading the secret diary. Turn in the diary and you'll get a Lore Document. Lore Document #27: This Lore Document can be found by searching the corpse near the entrance to the Sewers near the eastern hideout on at Stonebridge Cemetery. Lore Document #28: This Lore Document is located at the Docks and can be purchased from Martin Nightingale. Lore Document #29: This Lore Document can be found by talking to Mortimer in Pembroke Hospital to get his quest. When investigating his house, search around and you'll find a Lore Document. Lore Document #30: This Lore Document is also located in Pembroke Hospital. Find the small hideout near the “H” in the Hospital title on your map. In the hideout you'll find a Lore Document. There you have it, a guide to all 30 collectible Lore Documents and where you can find them in Vampyr. Having trouble unlocking the Unlife is Strange achievement? Be sure to check out our guide on how to water the plant in Vampyr, and stay tuned for more Vampyr guides here at AllGamers! By reading through this guide, you should now know where to find all 30 collectible Lore Documents in Vampyr.